Reviews of books, teas, and the occasional personal musing. Life-long friends, they went their separate ways. Now they are together again, though each other holds secrets from the the others in his heart. They speak of a world shadowed with rumors of war. They speak of tales with strange monsters, creatures of myth, creatures of legend. They do not speak of their secrets. Not then. Not until a chanced encounter with a beautiful, sorrowful woman, who bears a magical crystal staff draws the companions deeper into the shadow forever changing their lives and shaping the fate of the world. No one expected them to heroes. This year is the 30th anniversary of the start of one of my favorite fandoms: Dragonlance! I’ll never forget when I started reading Dragonlance books. I was twelve and my cousin loaned me the book while we were on vacation at her parent’s cottage. The weather was gorgeous and the cottage right on the beach but I couldn’t pull my nose out of the book until I was finished. 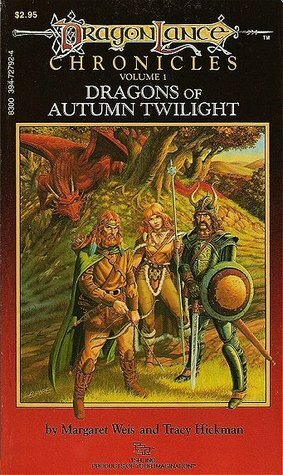 When I got my preteen hands on a battered copy of Dragons of Autumn Twilight I took my first step into Krynn and deep into the fantasy genre. For the next decade I rarely read a book that wasn’t fantasy and I place firm blame (and ridiculous amounts of gratitude) on Dragons of Autumn Twilight for that. And when that same cousin and I found a box of Dragonlance books in the dusty backroom of the used bookstore in the little town we vacationed in, it was Christmas in July! We had both reread the Chronicles series twice by then and were anxious to devour the titles that had taunted us from the first page of Dragons of Autumn Twilight. Mind you, this was in the dark ages before anything but dial up internet (and not everyone even had that) and eBooks. Back before Amazon and internet retailers being able to deliver your desired reading material to your front door in two days. It was miserable. But finding that stack of musty treasured books and meeting the Companions for the first time? Those are memories I will always treasure just as I will always love this book for being such a large part of my youth. From the cover art (I love you Larry Elmore. Always.) to each chapter of characters I will always love, Dragons of Autumn Twilight left an impression on me that I’ll never shake. And I’m ever grateful for it. One of the best debut novels I've ever read! 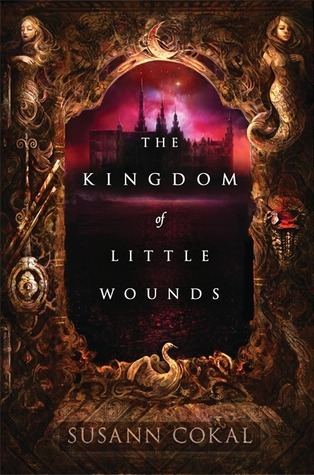 Susann Cokal has created a multiple PoV fairy tale in The Kingdom of Little Wounds that heart wrenching and endearing. Even the bad guys have motives you can understand, if not support, in this moving tale. food, crafts, nerdy things, travel, etc. Mostly books, coffee & some cats. Traveling through worlds both real and imaginary.